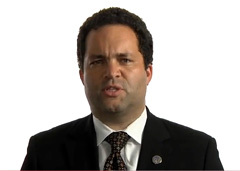 An official NAACP video for Saturday's One Nation rally (featuring their leader Ben Jealous, among others) claims that their movement includes "Conservatives and moderates, progressives and liberals." But a look at the actual "endorsing organizations" on the One Nation website doesn't list conservative groups, but it does include the Communist Party USA, the Committee of Correspondence for Democracy and Socialism (founded as a "moderate" wing of the CPUSA), the International Socialist Organization (publishers of SocialistWorker.org), and the Democratic Socialists of America (as well as its Chicago, Detroit, and New York chapters). And the liberals get mad when you associate them with socialism. Well, what are these groups doing on this list, then? Where are the media worrying about "fringes" and "extremists"? These endorsements have been missing from news accounts. AP's pre-protest dispatch by Nafeesa Syeed surgically began "Groups pushing for progressive policies will gather in the nation's capital this weekend for a march aimed at recapturing momentum for their agenda and mobilizing supporters before next month's midterm elections." Krissah Thompson left this angle out in her Washington Post story. But first, we want to tell you about One Nation Working Together. That's the name of a rally scheduled for Saturday here in Washington. The group spearheading the march includes civil rights organizations, gay rights activists and labor groups, among others. The rally is pitched as a challenge to Glenn Beck's attention-getting march in August, but it's also scheduled for exactly a month before this year's midterm elections in November, and it's attempting to focus the nation's attention on jobs, justice and education. We wanted to know more, so we've called two of the many people scheduled to speak at the event. With us now is Janet Murguia, the president and CEO of the National Council of La Raza. La Raza is, of course, the largest national Latino civil rights and advocacy organization in the United States. Also with us is Randi Weingarten. She's the president of the American Federation of Teachers, which has about 1.5 million members. I welcome you both. Thanks for joining us. And for additional perspective on the midterms, we've also called Karen Finney. She's a former communications director for the Democratic National Committee and a commentator on MSNBC. Welcome to you, as well. The idea that "progressives" were trying to accomplish political goals did seep in, and Martin professed that this did seem to be about electing Democrats. But reporters aren't finding any reason to see trouble for Democrats in extremist elements in their base. Organizers of the rally say their demonstration complements, rather than competes with, the Rally to Restore Sanity that the host of “The Daily Show,” Jon Stewart, has announced for Washington on Oct. 30. Those behind next Saturday’s rally assert that their event shares themes with Mr. Stewart’s in opposing Tea Party negativism and extremism.